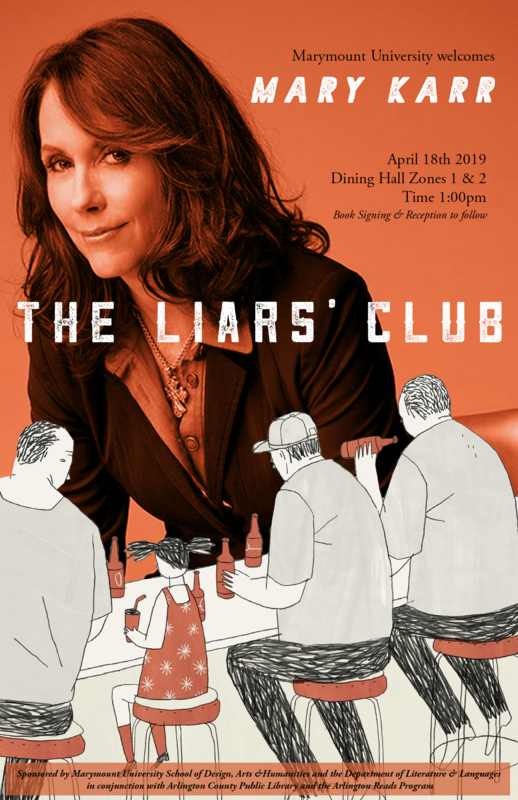 Bestselling author Mary Karr will visit Marymount this April to talk to first-year composition students about her first memoir, The Liar's Club, which won nonfiction prizes from PEN and the Texas Institute of Letters. Recently, Entertainment Weekly rated it number four in the top one hundred books of the past twenty-five years. Her second memoir, Cherry, which was excerpted in The New Yorker, also hit bestseller and "notable book" lists at the New York Times and dozens of other papers nationwide. Her most recent book in this autobiographical series, Lit: A Memoir, is the story of her alcoholism, recovery, and conversion to Catholicism. Karr is an award-winning poet and best-selling memoirist. She is the author of the critically-acclaimed and New York Times best-selling memoirs and five poetry collections, most recently Tropic of Squalor. Karr is also a songwriter, having collaborated with Rodney Crowell, Norah Jones, Lucinda Williams and others on a country album called KIN. Her many awards include The Whiting Writer's Award, an NEA, a Radcliffe Bunting Fellowship, and a Guggenheim. She is also a regular contributor to The New Yorker, The Atlantic, and Poetry magazine. Karr is the Peck Professor of Literature at Syracuse University and she lives in New York City.